A visit to the Dinosaurs makes for a great day out, and they are a popular visitor attraction — free to visit and open daily. The Dinosaurs are located in Crystal Palace Park, one of London’s great green spaces. The Crystal Palace Dinosaurs section of the park is free to visit and is open during the park’s opening hours. Getting to the park is easy. It is served by Transport for London (buses and London Overground) and numerous rail operators. The current Crystal Palace rail station (CYP) dates from the 19th century and was used by visitors to the original amusement park. Parking is available, too, and the area is extremely popular with cyclists. The Dinosaurs and geological landscapes are located by the lakes in the south section of the park near the Penge entrance and the Information Centre. The statues are outdoors, so please be mindful of local weather conditions. The site is step-free and accessible on an unpaved footpath, though this can be muddy in wet weather. The location is well sign-posted within the park. As you go round the lakes keep an eye out for signage with more information on all the statues and geological landscapes. The Penge end of the park includes a small information centre open on weekends, public toilets open when the park gates are open and a new cafe, to be open from April 2019. The park is owned and managed by London Borough of Bromley. Surrounding the park are substantial villages, including Crystal Palace, Penge, Anerley, and Sydenham. There is an excellent range of restaurants and pubs nearby. School groups frequently visit the Dinosaurs, and children might benefit from bringing a simple pair of binoculars. The statues are viewed from a distance; please note that anyone climbing on the statues is trespassing. They’re risking charges to criminal damage because Grade 1 listed monuments are protected under law. The statues are broadly arranged by geological age as you face the islands, with the oldest species (the Labyrinthodons and Dicynodons) on the far right, and the most recent species (the giant deer Megaloceros and the giant ground sloth Megatherium) on the Quaternary islands to the left. An audio tour for the dinosaurs is available via AudioTrails. 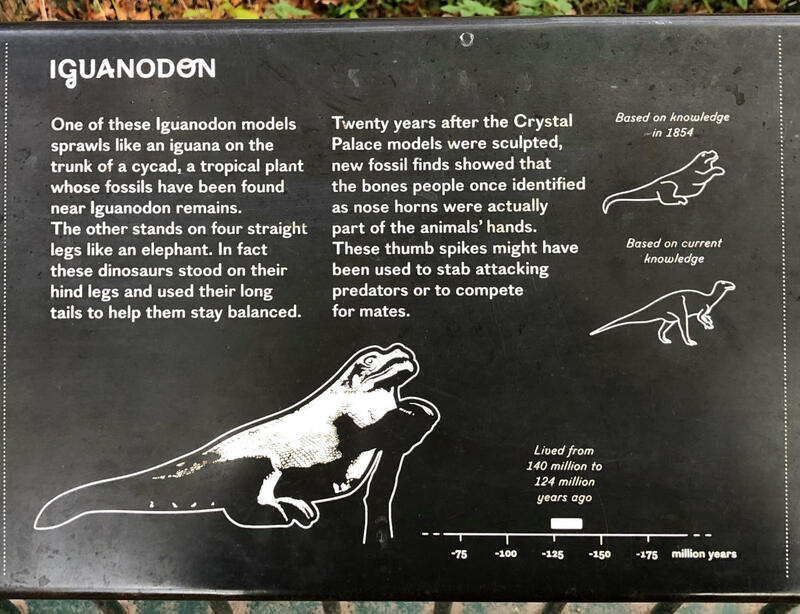 This video, produced by our our project partner the Lost Valley of London, is an imaginative and light-hearted introduction to the sculptures and shows how much fun a visit to Crystal Palace Dinosaurs can be. Why visit when photographs are easy to view online? There’s more to the site than the statues themselves. The statues are set within a model geological landscape that tells an important story. Other original features are present, too. Photographers tend to post photographs only of the big dinosaurs. There are many more statues to see, and each has personalities of their own. As when visiting an art gallery, these statues are great works of art and have an aesthetic within their space that is impossible to capture on film. Crystal Palace Park is one of London’s great green spaces. It’s a popular local and national treasure. It is off the usual London tourist trails.